Can a robot musician move you? That’s the question posed by the Robots Love Music exhibition at Utrecht’s Museum Speelklok. Dedicated to the world of self-playing musical instruments, there are street organs, wind instruments, and the world famous violina, dubbed “The Eighth Wonder of the World”. Some date back to the 16th Century, but it’s the modern day robots, complete with AI and machine learning, that form the heart of this temporary exhibition. Most impressive – in theory – is Shimon, a machine that can react to, or play along with, a human musician in real time, creating improvisational pieces on a marimba based on what’s being played to it. The results, however, are somewhat mixed. We watch a demonstration with piano and guitar, but what’s produced is somewhat lacking in melody and structure; at times, it just sounds like random notes. We’re invited to have a go at playing with Shimon ourselves, but soon learn it can’t understand chords – only individual notes. It’s all a little limited, and the ultimate goal – a machine so skilled that it’s indistinguishable from a human player – seems a long way off. Yet such future orientated concepts fit perfectly with the ethos of the festival we’re here to enjoy, Le Guess Who? Now in its 12th year, it has become one of the most forward-thinking music events anywhere, redefining what a modern festival should be and aspire to. Their slogan for 2018 is “A celebration of sound”, an apt description given how many of the artists present have pushed past traditional boundaries into entirely new realms and challenge the very notion of what can be considered “music”. Le Guess Who? 2018 from Joao MB Costa on Vimeo. It’s a direction the festival has been moving in for a few years now. In 2016, one of the curators was Wilco; the year before, St. Vincent played. This year it’s Moor Mother, Devendra Banhart, and Shabaka Hutchings doing the curating, and all three have dug deep to produce the most diverse, eclectic, and challenging lineup yet. 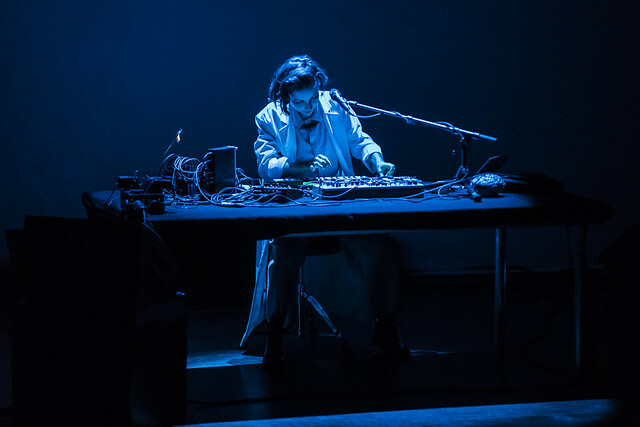 There’s a sprawl to the music on offer that can be difficult to navigate, taking in avant-garde jazz, Indian Carnatic music, blistering techno, minimalist percussion, experimental hip-hop, spoken word, and a host of improvisational and performance artworks. If that sounds like hard work, you’re right. Le Guess Who? challenges as much as entertains, something the founders have been very explicit about, believing that more esoteric fare deserves to sit alongside mainstream acts and be enjoyed by a broader spectrum of the public. The presence of queues to get into some of the smaller venues bears this out, even though there’s a tendency for audiences to thin out after three or four songs. And as people bustle between rooms in the huge TivoliVredenburg and to the outlying venues, you sense that everyone’s on their own journey of discovery, wide-eyed and eager to immerse themselves in something new. Yves Tumor delivers that in spades. The near-pitch dark basement club BASIS is the perfect setting for his eerie, enigmatic noise-pop; with zero lighting, he bounds and crawls across the stage to blasts of noise and unsettling soundscapes. The club walls taper towards the stage, and that sense of claustrophobia is reflected in his music; loud, disorientating, yet utterly compelling. Blanck Mass conjures something similar, albeit with completely different base materials. His glitchy soundscapes and aggressive dissonance seem to swirl around the room like a hurricane, the cacophony accompanied by dystopian renderings of cartoon characters and trippy visuals on a massive screen. It’s thrilling and immersive, a spectacle that draws you into its madness. The festival is replete with sets such as this, post-genre artists burning up convention and defiantly marching past tradition to the tune of their own imagination. JPEGMAFIA is on incendiary form running through his intense mix of hip-hop and trap, Joe Coleman’s raw beat poetry is tinged with sadness, while minimalist composer Midori Takada gives a masterclass in precision and grace that’s as much performance art as it is a set. There are numerous others we miss that colleagues rave about; Senyawa’s warping of traditional Indonesian music, Lucrecia Dalt’s surreal electronic compositions, Oliver Coates modern, post-classical cello explorations, and 700 Bliss, the explosive collaboration between Moor Mother and DJ Harem that pulls in heavy beats, Middle Eastern melodies, Afrofuturism, and lyrics that dissect black American history. Le Guess Who? has always excelled at looking far afield and elevating traditional forms of music. 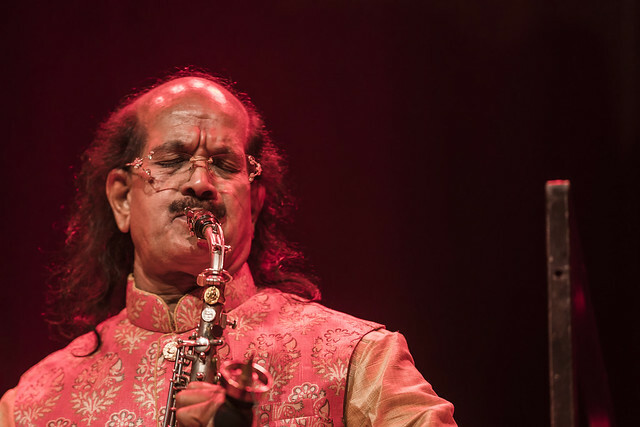 Kadri Gopalnath is a saxophone maestro and pioneer who’s spent the best part of 20 years trying to integrate his instrument into traditional Indian Carnatic music; a reverential Sunday slot in the Grote Zaal is a fitting setting for one of his rare European performances. Sitting cross-legged, he and his band conjure hypnotic rhythms and joyful melodies, a riot of colour and feeling. Cüneyt Sepetçi takes this a step further, blasting out upbeat Eastern disco-trash on his clarinet with the help of rudimentary beats and a keyboardist. It’s feel-good and uplifting, traditional songs imbued with a celebratory tone and vibrancy that turns most of Cloud Nine into a dance floor. All of which is the perfect preparation for Islam Chipsy & EEK and Sons of Kemet XL. Nothing quite prepares you for the energy and madness that both bring to the stage – on record, it’s just not the same. The former are the ultimate party band, stomping through songs at a breakneck pace and amping up the audience. The thump of two drummers is the perfect accompaniment to Chipsy’s keyboard wizardry, his fingers dancing over the keys as they drive everything forward. Sons Of Kemet double up on this, appearing with no less than four drummers. 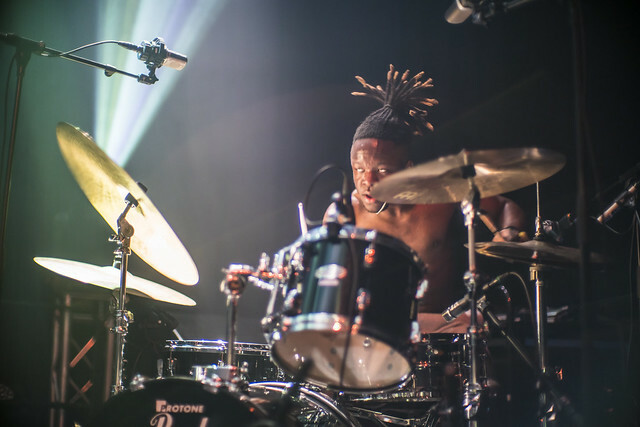 The result is a blitzkrieg of beats, a rhythmic rush that spins faster and faster, goaded on by Shabaka Hutchings’ mesmeric skills as he whirls around the stage like a dervish. It’s all rapturously received by one of the most packed rooms I’ve ever seen; after a few minutes, it’s one-in-one-out only. Rarely has a set seemed so perfectly in tune with a festival’s ethos, or an outpouring of love and respect so genuine and heartfelt. Those seeking quieter sets are not disappointed either, with many sets full of grace and quiet introspection. 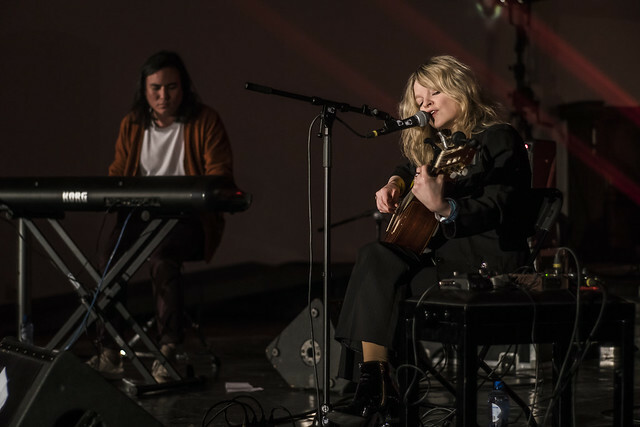 Jessica Pratt brings her delicately handcrafted songs to the sombre, sparse Janskerk, drawing listeners deep into her ghostly, softly melancholic songs. There’s a transfixing intimacy to her set, as if any distraction might shatter the delicate melodies left hanging in the air. Hilary Woods is afforded a similar hushed reverence, so much so that at times the seated audience in Theater Kikker seem unsure whether to clap or not. There’s a darker undercurrent to Woods’ work, with many songs starting off with deep drones and ominous rumbles. Songs from her acclaimed debut Colt are rendered with just an acoustic guitar or piano, laying them bare in skeletal form, yet they remain hauntingly beautiful. Near pitch darkness adds to the intrigue, her voice drifting through the gloom like a ghost. Le Guess Who? is not an event that indulges hazy nostalgia, and there are only two acts whose best years are arguably behind them. 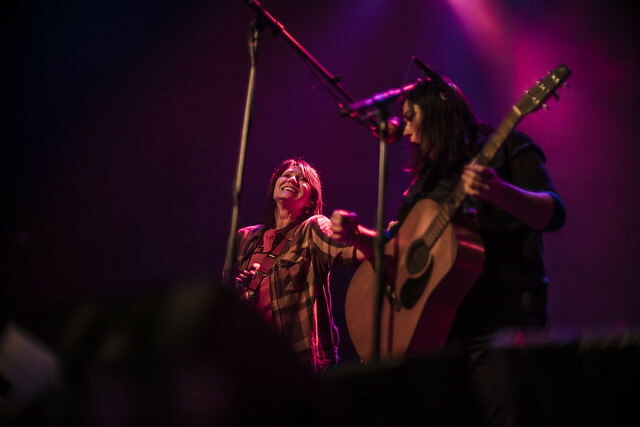 Mudhoney competently stroll through the hits, never missing a beat, but a more enigmatic presence is provided by The Breeders, touring new album All Nerve behind the iconic Last Splash lineup of Kim and Kelly Deal, Jim Macpherson on drums, and Josephine Wiggs on bass. At their best, they remain spellbinding, their loose, scuzzy, alt-pop fizzing nicely, but here they seem oddly distracted. Kim keeps poking and prodding at cables and her monitors, forever fidgeting around. ‘Canonball’ suffers a false start. Kelly shuffles through some papers. But when they lock in, their brilliance shines through, their new songs the equal to anything from their back catalogue (particularly the slow rumble of ‘Spacewoman’ and the proto-Pixies angst of ‘MetaGoth’). Even a misguided attempt at ‘Gigantic’ doesn’t detract from the sense of a band still testing out its limits, striving to repurpose the magic and push forward. But if they represent some idolized notion of alt indie’s past, Black Midi are surely the future. Arriving on a wave of hype and heralded as “the best band in London”, the math-noise four-piece are something of a mystery owing to almost zero online presence. That doesn’t stop a sizable crowd gathering at 2am on the opening night to see what all the fuss is about, and no one leaves disappointed. “Post-Devo” notes a colleague drily, and there are also hints of post-punk and Ought in the frontman’s nasal delivery and spidery riffs. Dirty grooves, jazzy riffs, atonal guitars, primal screeching, spoken word, and explosions of noise all feature prominently too, back by a demon of a drummer who flips between intricate rhythms and full on Moon madness. It’s not hard to see why their “glorious racket” has already won them buckets of acclaim; they subvert notions of what a guitar band in 2018 can be, pulling down the structures that guitar, bass, and drums normally operate in. Black Midi are weird, thrilling, and purposeful all at the same time, proving that in music one’s mindset and imagination is more important than genre constructs or what instrument you happen to excel at. They point to a future where ideas reign supreme, and new forms can be wrought from traditional means. 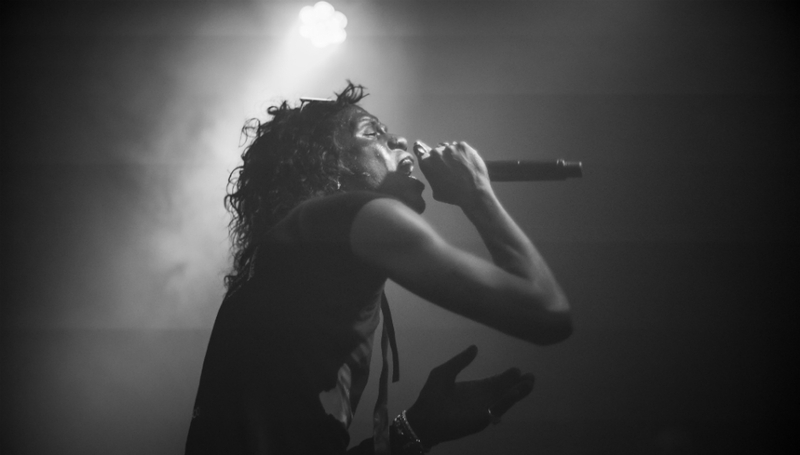 In elevating such artists from all across the musical spectrum, Le Guess Who? continues to blaze a trail for contemporary music events and to celebrate sound in all its wondrous forms. Le Guess Who? takes place in Utrecht, The Netherlands, every November. For more information about the festival, including dates and tickets for the 2019 edition, please visit their official website.